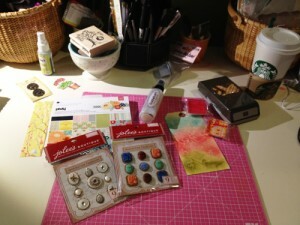 I am a fairly new WOYWW participant and really enjoy it and very excited about our ATC swap. I have only made a few in the past but look forward to the challenge. I haven’t been working on much of anything. Our washer broke this week and I have been one crabby momma! Today they arrive with the new washer and I can’t express what 7 days of no laundry being washed in this house means. Pure chaos that’s what it is. So I took a picture of some new purchases since nothing has occured at my desk in a bit. I recently went to Michael’s and bought the cuteies embellishments by Jolee’s Boutique called French General that are inspired from old world France. They are so pretty I know I am going to have a hard time parting with them. I also bought some more PB&J paper brom Basic Grey and two little stamps to use on small projects (oh, maybe I will use them on some ATCs) You can also see a tag I created with the Goosebumps Shimmer Texture Spray by Tsukineko. I am still learning how to use it. I used it as a resist on the tag. Very cool stuff. Of course my desk isn’t complete without my Soy Chai from Starbucks. It’s just heaven in a cup! Well sorry for the short post. Think I said this last week. We have quite a bit in common. Yes, I have to pace myself with the Chai. Just love it. I drink it cold on hot days and hot on cold days..
Maybe we can be Project Life support gals because I am perpetually behind!! The beauty of WOYWW is that there is always someone amazing to meet. I will try to email you from your site to exchange addresses. Hi Annie, my email address is belinda@belindascrafts.com Send your address so we can swap. And I am not a pro by any means at making ATC but the fun is in the giving right? ha ha. WEll, I got a new machine after 7 WEEKS of waiting, not 7 days…I can so relate! Been dragging 3 loads a day to my moms place every morning which I tried to to between teaching my classes. Not fun I can tell you. Finally threw all my toys out the cot at the store where I bought it as it was still under warranty and Whirlpool head office here was messing me around and sending wrong parts etc, I won’t bore you with the nitty gritty, but the store came to the rescue and got my money back for me and I now have an LG, all in the same day I threw my toys…sometimes it pays to make demands esp as I had not been unreasonable. As for you purchases, they look great. Green that you guys have Michaels…would love a store like that here. I am just back from work, will email you when I finish desk hopping. Glad to have you in the WOYWW tribe here! Thanks for the peek at your desk today! Happy WOYWW birthday! -Amanda x98! I haven’t completed my ATC’s yet but plan on doing a wee run on them tomorrow when I get back home. Not had as much time as I would have liked to myself this week! I will e-mail you when I’ve finished them and they are ready to post ok? Great post, lovely new things to play with. Enjoy. Hi Belinda, thanks for stopping by my blog. I sent you my address, I made extras for just such an occassion. Would love to swap. I think you put the wrong number in your comment. The washer is great. I am enjoying it. Starbucks is a chain of coffeeshops in the US and I believe it is located in some other countries too. They are overpriced but I enjoy their Soy Chai teas. Soy is a milk substitute and Chai is a tea very popular in India and various cultures. I fell for it years ago and can’t get enough of it. it’s a little spicy but if you add milk or soy it is a dream. It took me a few days to get to the Post Office, but I finally got there this morning to post yours off. I will let you know when yours arrives, usually about a week from the USA to South Africa. Oh I can’t wait to receive your package. I anxiously await it’s arrival!! What I would give to go shopping at Michaels, you are so lucky. I am travelling to the States next year hopefully and will do the Michaels shop as one of my priorities. Sorry about your washer, glad you have another now. Oh I hope you can visit Michael’s another good store is AC Moore. It’s another craft store chain here as well. Oh what I would give to go to Australia. It’s on my list. I hope you enjoy your time when you come to the States.